The science fiction writer H G Wells predicted that in modern technological societies statistical thinking will one day be as necessary for efficient citizenship as the ability to read and write. How far have we got, a hundred or so years later? A glance at the literature shows a shocking lack of statistical understanding of the outcomes of modern technologies, from standard screening tests for HIV infection to DNA evidence. For instance, doctors with an average of 14 years of professional experience were asked to imagine using the Haemoccult test to screen for colorectal cancer.1 2 The prevalence of cancer was 0.3%, the sensitivity of the test was 50%, and the false positive rate was 3%. The doctors were asked: what is the probability that someone who tests positive actually has colorectal cancer? The correct answer is about 5%. However, the doctors' answers ranged from 1% to 99%, with about half of them estimating the probability as 50% (the sensitivity) or 47% (sensitivity minus false positive rate). If patients knew about this degree of variability and statistical innumeracy they would be justly alarmed. Here we deal with three numerical representations that foster confusion: single event probabilities, conditional probabilities, and relative risks. In each case we show alternative representations that promote insight (table). These “mind tools” are simple to learn. Finally, we address questions of the framing (expression) and manipulation of information and how to minimise these effects. The statement “There is a 30% chance of rain tomorrow” is a probability statement about a single event: it will either rain or not rain tomorrow. Single event probabilities are a steady source of miscommunication because, by definition, they leave open the class of events to which the probability refers. Some people will interpret this statement as meaning that it will rain tomorrow in 30% of the area, others that it will rain 30% of the time, and a third group that it will rain on 30% of the days like tomorrow. Area, time, and days are examples of reference classes, and each class gives the probability of rain a different meaning. The same ambiguity occurs in communicating clinical risk, such as the side effects of a drug. A psychiatrist prescribes fluoxetine (Prozac) to his mildly depressed patients. He used to tell them that they have a “30% to 50% chance of developing a sexual problem” such as impotence or loss of sexual interest.2 Hearing this, patients were anxious. After learning about the ambiguity of single event probabilities, the psychiatrist changed how he communicated risk. He now tells patients that of every 10 people who take fluoxetine three to five will experience a sexual problem. Patients who were informed in terms of frequencies were less anxious about taking Prozac. Only then did the psychiatrist realise that he had never checked what his patients had understood by “a 30% to 50% chance of developing a sexual problem.” It turned out that many had assumed that in 30% to 50% of their sexual encounters something would go awry. The psychiatrist and his patients had different reference classes in mind: the psychiatrist was thinking in terms of patients, but the patients were thinking in terms of their own sexual encounters. Frequency statements always specify a reference class (although the statement may not specify it precisely enough). Thus, misunderstanding can be reduced by two mind tools: specifying a reference class before giving a single event probability or only using frequency statements. The chance of a test detecting a disease is typically communicated in the form of a conditional probability, the sensitivity of the test: “If a woman has breast cancer the probability that she will have a positive result on mammography is 90%.” This statement is often confused with: “If a woman has a positive result on mammography the probability that she has breast cancer is 90%.” That is, the conditional probability of A given B is confused with that of B given A.4 Many doctors have trouble distinguishing between the sensitivity, the specificity, and the positive predictive value of test–three conditional probabilities. Again, the solution lies in the representation. Consider the question “What is the probability that a woman with a positive mammography result actually has breast cancer?” The box shows two ways to represent the relevant statistical information: in terms of conditional probabilities and natural frequencies. The information is the same (apart from rounding), but with natural frequencies the answer is much easier to work out. Only seven of the 77 women who test positive actually have breast cancer, which is one in 11 (9%). Natural frequencies correspond to the way humans have encountered statistical information during most of their history. They are called “natural” because, unlike conditional probabilities or relative frequencies, they all refer to the same class of observations.5 For instance, the natural frequencies “seven women” (with a positive mammogram and cancer) and “70 women” (with a positive mammogram and no breast cancer) both refer to the same class of 1000 women. In contrast, the conditional probability 90% (the sensitivity) refers to the class of eight women with breast cancer, but the conditional probability 7% (the specificity) refers to a different class of 992 women without breast cancer. This switch of reference class can confuse the minds of doctors and patients alike. 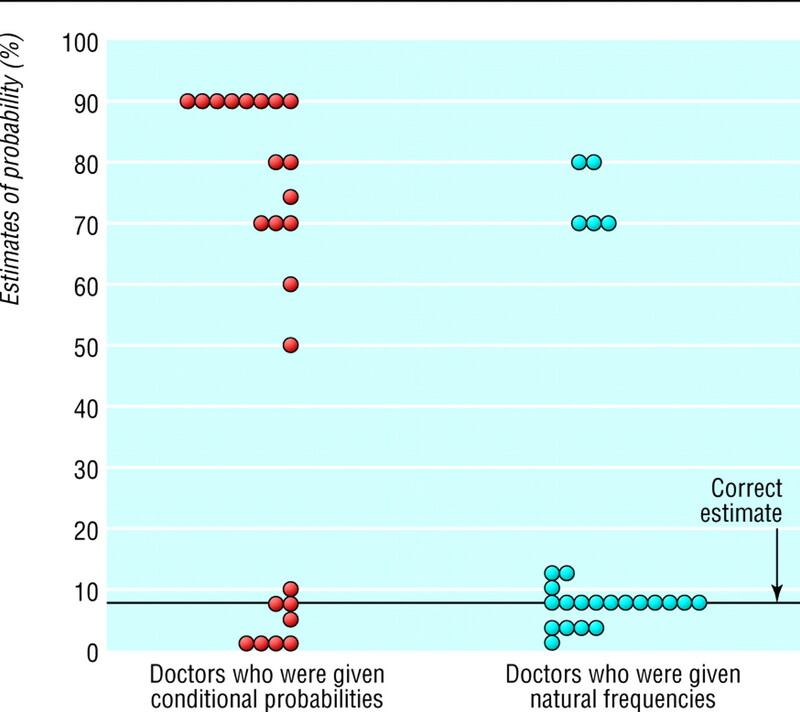 Figure 1 shows the responses of 48 doctors, whose average professional experience was 14 years, to the information given in the box, except that the statistics were a base rate of cancer of 1%, a sensitivity of 80%, and a false positive rate of 10%.1 2 Half the doctors received the information in conditional probabilities and half in natural frequencies. When asked to estimate the probability that a woman with a positive result actually had breast cancer, doctors who received conditional probabilities gave answers that ranged from 1% to 90%, and very few gave the correct answer of about 8%. In contrast most doctors who were given natural frequencies gave the correct answer or were close to it. Simply stating the information in natural frequencies turned much of the doctors' innumeracy into insight, helping them understand the implications of a positive result as it would arise in practice. Presenting information in natural frequencies is a simple and effective mind tool to reduce the confusion resulting from conditional probabilities.6 This is not the end of the story regarding the communication of risk (which requires adequate exploration of the implications of the risk for the patient concerned, as described elsewhere in this issue7), but it is an essential foundation. Women aged over 50 years are told that undergoing mammography screening reduces their risk of dying from breast cancer by 25%. Women in high risk groups are told that bilateral prophylactic mastectomy reduces their risk of dying from breast cancer by 80%. These numbers are relative risk reductions. The confusion produced by relative risks has received more attention in the medical literature than that of single event or conditional probabilities.9 10 Nevertheless, few patients realise that the impressive 25% figure means an absolute risk reduction of only one in 1000: of 1000 women who do not undergo mammography about four will die from breast cancer within 10 years, whereas out of 1000 women who do three will die.11 Similarly, the 80% figure for prophylactic mastectomy refers to an absolute risk reduction of four in 100: five in 100 women in the high risk group who do not undergo prophylactic mastectomy will die of breast cancer, compared with one in 100 women who have had a mastectomy. One reason why most women misunderstand relative risks is that they think that the number relates to women like themselves who take part in screening or who are in a high risk group. But relative risks relate to a different class of women: to women who die of breast cancer without having been screened. The probability that a woman has breast cancer is 0.8%. If she has breast cancer, the probability that a mammogram will show a positive result is 90%. If a woman does not have breast cancer the probability of a positive result is 7%. Take, for example, a woman who has a positive result. What is the probability that she actually has breast cancer? Eight out of every 1000 women have breast cancer. Of these eight women with breast cancer seven will have a positive result on mammography. Of the 992 women who do not have breast cancer some 70 will still have a positive mammogram. Take, for example, a sample of women who have positive mammograms. How many of these women actually have breast cancer? In all these representations the ultimate source of confusion or insight is the reference class. Single event probabilities leave the reference class open to interpretation. Conditional probabilities such as sensitivity and specificity refer to different classes (the class of people with and without illness, respectively), which makes their mental combination difficult. Relative risks often refer to reference classes that differ from those to which the patient belongs, such as the class of patients who die of cancer rather than those who participate in screening. Using transparent representations such as natural frequencies clarifies the reference class. Pictorial representations of risk are not immune to manipulation either. For example, different formats such as bar charts and population crowd figures could be used.21 Or the representation could appear to support short term benefits from one treatment rather than long term benefits from another.22 Furthermore, within the same format, changing the reference class may produce greatly differing perspectives on a risk and may thus affect patients' decisions. Figure 2 relates to the effect of treatment with aspirin and warfarin in patients with atrial fibrillation. 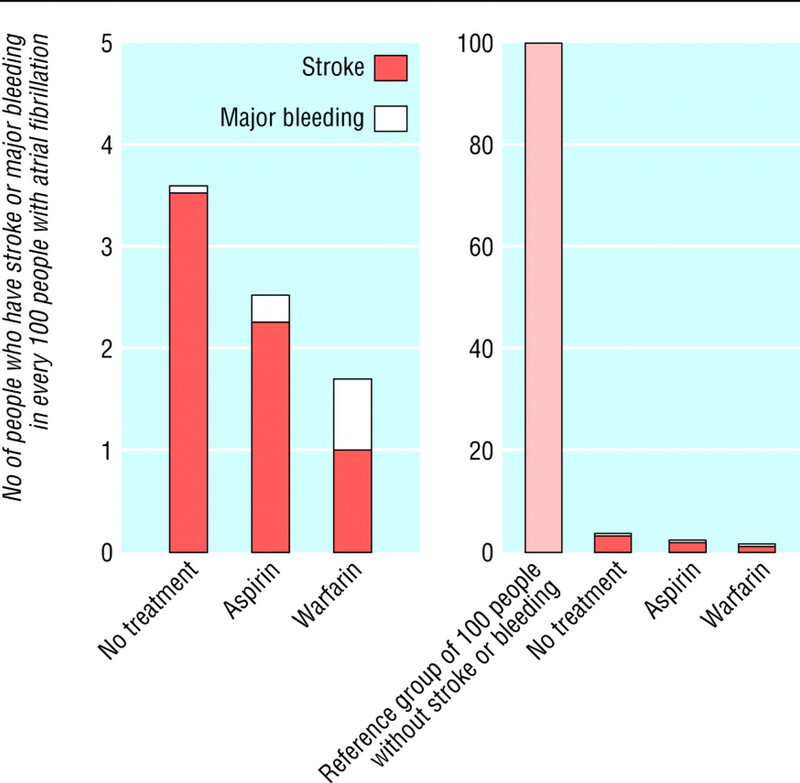 On the left side of the figure the effect of treatment on a particular event (stroke or bleeding) is shown relative to the class of people who have not had the treatment (as in relative risk reduction). On the right side the patient can see the treatment effect relative to a class of 100 untreated people who have not had a stroke or bleeding (as in absolute risk reduction). The wide scope for manipulating representations of statistical information is a challenge to the ideal of informed consent.2 16 Where there is a risk of influencing outcomes and decisions among patients, professionals should consistently use representations that foster insight and should balance the use of verbal expressions–for example, both positive and negative frames or both gain and loss frames. The dangers of patients being misled or making uninformed decisions in health care are countless. One of the reasons is the prevalence of poor representations. Such confusion can be reduced or eliminated with simple mind tools.2 23 Human beings have evolved into good intuitive statisticians and can gain insight, but only when information is presented simply and effectively.24 This insight is then the platform for informed discussion about the significance and burden of risks and the implications for the individual or family concerned. It also makes the explanation of diseases and their treatment easier. Instruction in the efficient communication of statistical information should be part of medical curriculums and continuing education for doctors. Contributors and sources The research on statistical representations was initially funded by the Max Planck Society and has been published in scientific journals as well summarised in GG's book Reckoning With Risk: Learning to Live With Uncertainty. The work on framing is based on research by AE.
. Using natural frequencies to improve diagnostic inferences. Acad Med 1998; 73: 538–40.
. How risks of breast cancer and benefits of screening are communicated to women: analysis of 58 pamphlets. BMJ 1998; 317: 263–4.
. Interpretation by physicians of clinical laboratory results. N Engl J Med 1978; 299: 999–1000.
. How to improve Bayesian reasoning without instruction: frequency formats. Psych Rev 1995; 102: 684–704.
. Communicating statistical information. Science 2000; 290: 2261–2.
. Strategies to help patients understand risks. BMJ 2003; 327: 745–8.
. Efficacy of bilateral prophylactic mastectomy in women with a family history of breast cancer. N Engl J Med 1999; 340: 77–84.
. Does the frame affect the picture? A study into how attitudes to screening for cancer are affected by the way benefits are expressed. J Med Screen 1998; 5: 137–40.
. Document-based decision-making. Rouet JF, Levonen A, Biardeau A eds. Multimedia learning: cognitive and instructional issues. Amsterdam: Pergamon, 2001: 31–43.
. An overview of the Swedish randomised mammography trials: total mortality pattern and the representativity of the study cohorts. J Med Screen 1996; 3: 85–7.
. Evidence based purchasing: understanding results of clinical trials and systematic reviews. BMJ 1995; 311: 1056–9.
. Disease impact number and population impact number: population perspectives to measures of risk and benefit. BMJ 2000; 321: 950–3.
. Compliance to health recommendations: a theoretical overview of message framing. Health Educ Res 1988; 3: 161–71.
. Prospect theory: an analysis of decision under risk. Econometrica 1979; 47: 263–91.
. Presenting risk information: a review of the effects of “framing” and other manipulations on patient outcomes. J Health Commun 2001; 6: 61–82.
. The influence of framing on risky decisions: a meta-analysis. Organ Behav Hum Decis Process 1998; 75: 23–55.
. Explaining risks: turning numerical data into meaningful pictures. BMJ 2002; 324: 827–30.
. The visual communication of risk. J Natl Cancer Inst Monogr 1999; 25: 149–62.
. How can we help people make sense of medical data? Eff Clin Prac 1999; 2: 176–183.
. Frequency or probability? A qualitative study of risk communication formats used in health care. Med Decis Making 2001; 21: 459–67.
. Assumptions patients make when interpreting graphical displays of surgical data. Theor Surg 1994; 9: 129–33.
. Simple heuristics that make us smart. New York: Oxford University Press, 1999.
. Are humans good intuitive statisticians after all? Rethinking some conclusions from the literature on judgment under uncertainty. Cognition 1996; 58: 1–73.